DOT - I Say Ding Dong Shop - Buy Stickers, Decals & Unique Automobilia. 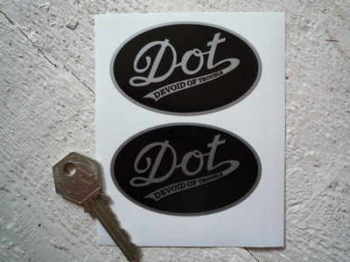 DOT 'Devoid Of Trouble' Black Oval Stickers. 3" Pair. DOT 'Devoid Of Trouble' Circular Stickers. 60mm Pair. DOT 'Devoid Of Trouble' Circular Stickers. Black & Silver. 60mm Pair. 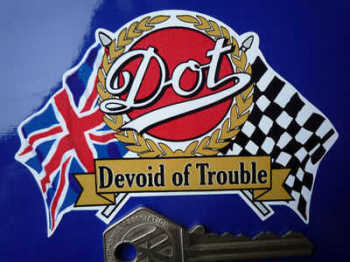 DOT 'Devoid Of Trouble' Flag & Scroll Sticker. 4". 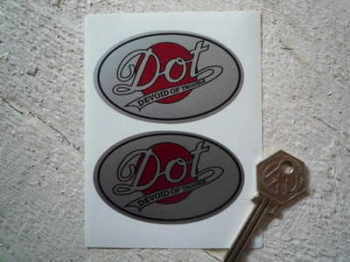 DOT 'Devoid Of Trouble' Silver & Red Oval Stickers. 3" Pair. DOT Manchester England Cut Out Style Sticker. 4".